It ain’t pretty, but it’s gooood. Just remember as we go on this journey together that we believe in certain principles around here. That animal protein or vegetable protein, if you’re going to eat, something has to die. And if I’m going to kill something in order to eat, then I want to use every part of it. So as you shimmy your way down the page keep reciting the mantra: nothing went to waste, nothing went to waste, used every part, used every part, and you’ll get through it just fine. Okay, ready? Hold my hand…ooh, you have soft hands, what do you use? Oh wait, okay…here we go. 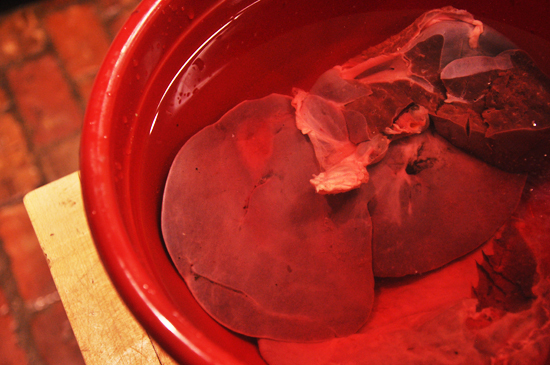 This is the liver of a deer I shot soaking in a bath of salt water. This is me slicing the liver of a deer on a bias. From an abstract point of view, these slices are rather pretty, don’t you think? I’ll be honest, I was sweating. It was like standing on the sun. But these are the sacrifices a girl has to make for liver. And since there was so much commotion, I didn’t take step-by-step pictures for you on this one, but I’ll use my words. I got a skillet very hot with oil. While it heated I sliced some onions thinly, and then some mushrooms. I gave the liver a quick sear on both sides, then removed the liver to a plate and sauteed the mushrooms and onions in the same skillet. 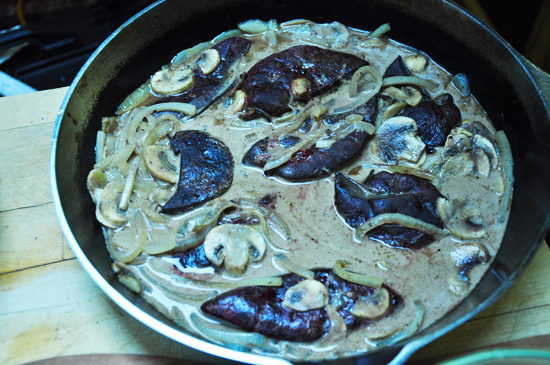 Then I returned the liver to the pan with the mushrooms and onions and added some vermouth. I would like to take a moment to reflect on vermouth. It is so spectacular in sauces, the smell and taste will send you into a revelry. Go buy a bottle of vermouth and put it in everything and see how much better your life is. One bottle of vermouth is all it takes to improve your life. Trust me. Okay, next came the whiskey. I poured a healthy amount of whiskey in the skillet and lit the whole pan on fire with a match. It was a great show and my eyebrows are recovering nicely. Like I said, this is what a girl has to do for liver. At the end you add cream and get this creamy, earthy, vermouthy dish that is quite simply, delicious. I made the heart, which I showed you the other day, and then the tenderloin which I’ll save for a rainy day. We all ate these things around a big table. 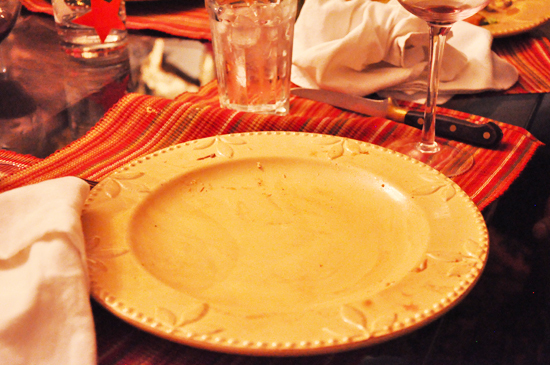 My friend Paul Michael summoned me over to examine his plate. He had wiped all visages of juice from it. 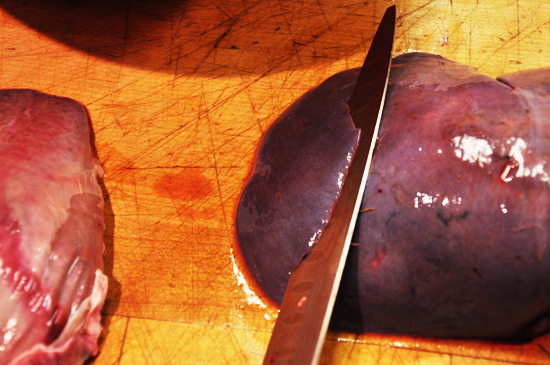 Tell me, do you like liver? Does it send you running for the hills? What’s the most far-out piece of meat you’ve ever eaten? p.s. If you want to catch up on the whole shebang of the “Delta Deer Hunt” it’s all right here: I, II, III, IV, and V.
Soak the liver in well-salted water for 30-60 minutes. Remove and rinse under running water and pat dry. Cut the liver into slices on a bias. Lay them on a plate and season with salt and pepper. Heat a skillet over medium-high heat with oil until you can see the heat coming off of it. Sear the liver slices on both sides, approximately 1 minute on each side. You want them medium rare at this point. 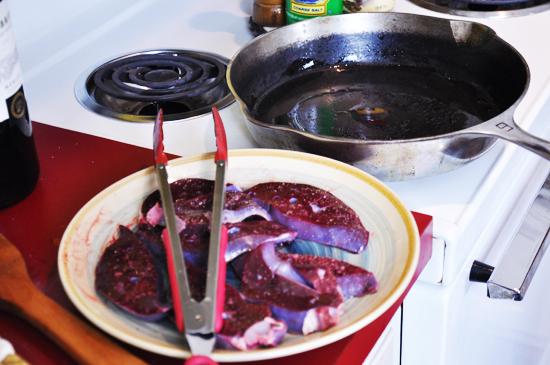 If your pan is too small to fit all of the liver in one batch, cook the liver in batches so you don't crowd the pan. 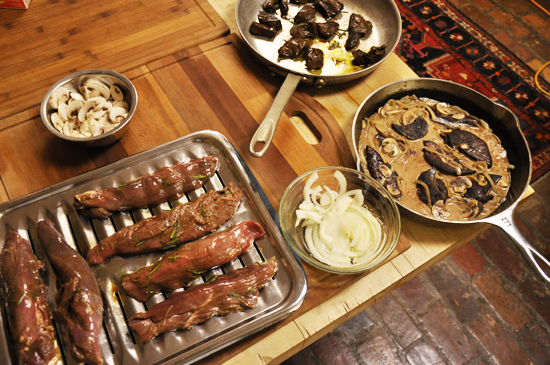 Remove all of the liver slices to a plate, add more oil to the skillet and saute the onions and mushrooms until they are soft. Season with salt and pepper as you go. Return the liver slices to the pan, add the vermouth and let simmer for a few minutes. Then add the whiskey. Light it on fire (flambée) with a match and stand back. Once the alcohol has cooked off and the flames have subsided, add the cream. Cook for a few more minutes, taste and adjust the seasoning. Serve immediately. I am in awe. You rule. It looks delicious! I love offal! Every last bit of it. I'm so glad I found your site, this is excellent! Great pictures, nice deer camp. Congratulations on your deer. Looking forward to reading over the next few weeks. Thanks Ray! I'm glad we've found each other and thanks for reading! I like chicken liver but I've never had deer liver. Could be my next thing… great post! I am actually feeling a little bad — just a little, mind you — that I didn't try to eat more liver as a kid whenever my mother offered it to me. But boy, the smell as it cooked was enough to kill any juvenile culinary adventure. That said, I'm willing to believe fresh deer liver and heart (and other organ meat for all I know) is far tastier than anything my mother got from the meat counter at the local grocery store. Maybe it all depends on it being in the right hands. Greg, it's never too late to give liver another chance ; ) Make your mama proud! Hank, leave it to you to have me googling words. Mazzafegati is a mouthful…liver sausage from Umbria, which I would love to try. Send some over! The belly?? okay…could you explain that a little? What cut…recipe?? I'll let you know about the open fire cooking. BTW, we are headed to the Culinary Institute (NY) for a special dinner on Sat., a friends son is graduating and the grads are doing the entire evening….the menu is very interesting. Hi Ray – well the belly of the pig is usually seen in the form of bacon. But fresh belly is sublime on a BBQ… that crispy skin and glistening fat is hard to equal. There are several other ways to cure it, one is called "tessa," another "pancetta"… I'll tell you what: in a few more weeks ESPNOutdoors.com is launching a page called "The Kitchen" in which they are going to feature my wild game cooking. And I'm planning on posting a whole bunch of curing recipes. I'll be sure to put belly at the top of the list! Sound good? Have a great time at CIA, it's a beautiful place. Cheers – G p.s. It just occured to me that you may have meant the belly of the deer… there's not a whole lot you can do with it as far as I know, except perhaps grind the meat to make burgers or use the scraps for stew and stock… I'll come up with some recipes there too. Yes, I meant the belly of the deer, that is why I was surprised at your comment. You did bring back some very pleasant memories of a couple of pig roasts though..sublime pretty much covers it….thank you for that:) I will be sure to check out your page on ESPNoutdoors. Dinner at the CIA was amazing and the soon to be grads did an excellent job, a great time was had by all! How do you think this would work with Lamb Liver? James, I think it would work just as well, though I can't say I've made it. It would probably have a stronger flavor. Just make sure not to overcook it. And let us know how it turns out! You are making a valuable contribution to real life food issues and for conservation by showing how real food originates and the sometimes tough facets of the harvest. You depict the whole process honestly and with the beauty and style we all aspire to. Next time you are in N. Florida (yeah sure) you are invited to my modernized 1896 farm to see one adaptation of your vision. Wow, thanks so much Bill! That's a lovely invitation and so nice of you to say. When I set up my hunting trips for this year I may take you up on that! Cheers. 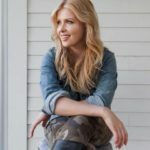 I just came across your website (through Shauna @ Gluten-Free Girl) and I have to say, I love it. The recipes all look fantastic, and I stand in great admiration of what you're doing. Kudos! Subbed marsala for vermouth, cooked the rest as written. Really great first experience with a challenging cut. Thanks! Wonderful! Vermouth is lovely too. Fantastic! 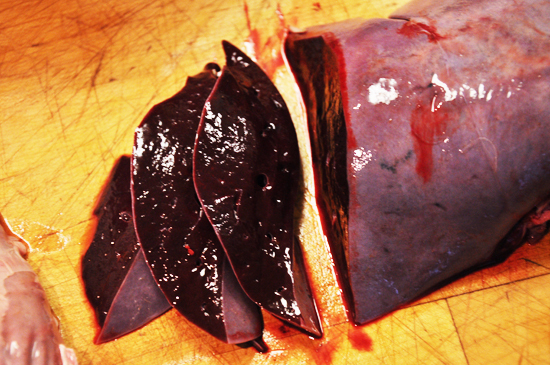 Deer liver is highly varied in taste, some areas have juniper which deer eat and the terpenes (pine-smelling substances) can give off-taste in the liver. No, not like fine juniper berries but like turpentine. I have the liver from a deer outside of this area, I will follow your suggestion of vermouth. My hunting buddies are convinced I am part Sioux because I also use the bones for soup. Waste nothing edible. You are so cool, pretty, smart and adventurous! I loved your hunting book. Living in South-east, Georgia, I grew up eating deer, squirrel and doves. Now I want to try more parts of these animals. I like to keep the squirrel hearts for my frying pan. 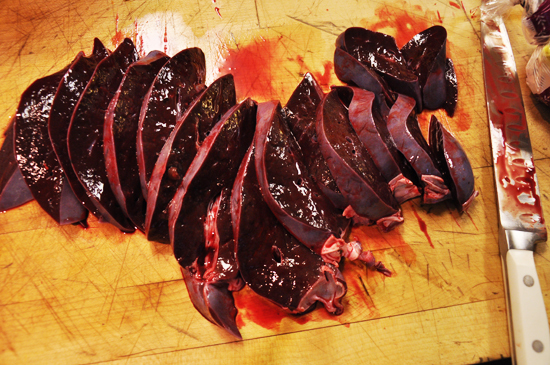 If I shoot another deer before the season is out I want to try the heart/liver with one of your recipes. My girl friend and I both have crushes on you !!!! Keep it up Miss Georgia. Post more pictures of you looking pretty holding guns. Venison Manhattan, I love it. I will try this recipe. My kids love deer liver! Of course, I tricked them the first time I prepared it and told them it was venison steaks cooked with onions and gravy. After they cleaned out the pot, I told them what it was. The look on their face was priceless! Now they can’t wait for deer season so we can eat it again. I always try to prepare it the night of the hunt, or at the latest the next day. I don’t like frozen and thawed liver. Gotta be fresh! Thank you for sharing these recipes! I agree with you. If I’m going to take an animal’s life, I’m going to utilize all of it. Can I purée this reipe for deer liver to make a liver mousse or is there a ifferent recipe? 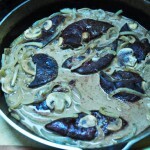 This recipe is better for a mousse: http://georgiap.webfactional.com/2010/08/15/recipes/liver-mousse/ Yum! How do I make a salt water bath. This is the first time I am making a deer liver mousse and I am a little aprhensive.thank you so much for your help. My son shot the deer and I am going to serve it tomorrow for Thanksgiving. A tablespoon of salt to a quart of water will do the trick! 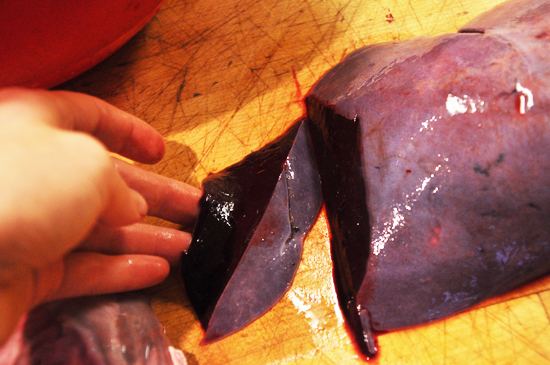 how do cook deer liver without the liquor. Pretty much any kind will do nicely: vegetable, deer, beef, wildfowl, poultry. Hint: veg broth made with RUTABAGA, turnip, potato, onion, celery, garlic and bay leaf is complex yet fast and easy. My son in law just gave me resh deer liver and we shared the heart. It wll be a fun experience cooking them. What ratio of salt to water do you consider well saturated? I didsoak the liver in milk overnight before I found yoyr blog. I would do about 1 teaspoon per 3 cups, roughly! Thanks for the recipe ! i’m a pork and beef liver lover from way back . But deer has always thrown me for a loop( not because of taste or it being wild meat , it just seems a little harder to cook . this looks like a simple yet tasty way for me to try this evening .Ill let you know how it turns out ! thanks again and safe hunting ! Really glad I found this! Your writing style and sense of humor are fantastic! Love it, and I’m going to try this recipe, too! Count me as a new follower! Wonderful! So nice to have you here Dan. is that a sweet vermouth, dry vermouth? Either one will work! I prefer dry vermouth. I hope you enjoy it! When you say cream, is That “Heavy whipp cream”?